This week's Mobile World Congress 2014 in Barcelona set a new attendance record: more Than 85,000 visitors, up 18% over 2013. 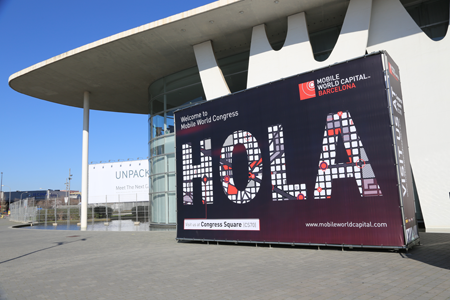 "By any measure, the 2014 Mobile World Congress was a stunning success and we thank our attendees, exhibitors, sponsors and partners for their continued support," said John Hoffman, CEO, GSMA Ltd. "Beyond the number of attendees and participating companies, the continued expansion of the event to address key adjacent industry sectors demonstrates just how pervasive mobile is in our everyday lives and how integrated it is becoming in everything that we do. It's gratifying to be part of such a dynamic, exciting industry." Mobile World Congress set additional records, with more than 1,800 exhibiting companies across 98,000 net square meters of exhibition and hospitality space. More than 3,800 international media and industry analysts attended the event. 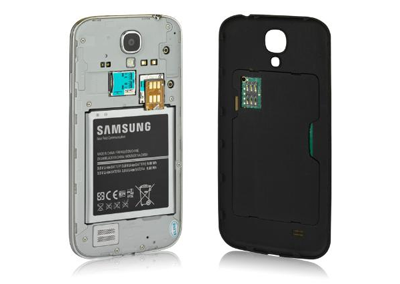 The GSMA estimates that 2014 Mobile World Congress will have contributed more than EUR 356 million and 7,220 part-time jobs to the local economy. The 2015 Mobile World Congress will be held 2-5 March 2015. NEC has introduced a Mobile Virtual Network Operator solution that leverages Network Functions Virtualization (NFV) to enable services such as traffic restrictions/filtering of communication data and collection of charging information. NEC’s vMVNO-SL enforces services between an MVNO's own communication network and a carrier's mobile network. NEC delivers the MVNO solution as software that runs on a virtualized all-purpose Intel Architecture (IA) server. It will be offered as one of NEC SDN Solutions’ NFV Solutions. The solution adopts NFV to achieve a variety of network functions on a virtual infrastructure of commercial-off-the-shelf IA servers, including the MVNO-GW functions conventionally achieved by dedicated hardware. This enables customers to begin with a single-server structure and to scale out their servers depending on business needs, thereby dramatically cutting back on capital expenditures. Qwilt, a provider of online video delivery and transparent caching solutions, and Procera Networks have formed a partnership to offer a transparent caching and Internet Intelligence solution for service providers. Qwilt’s QB-Series transparent caching technology and Procera’s PacketLogic platform together provide a plug-and-play solution to seamlessly deliver over-the-top (OTT) video traffic and improve quality of experience (QoE). 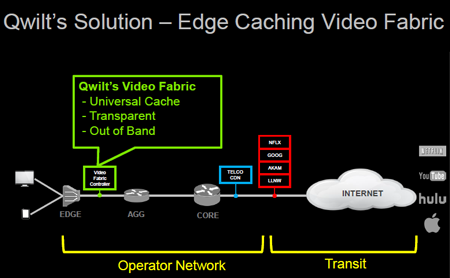 Ease of Deployment: For new deployments, a simple insertion model for the combined solution enables both application intelligence and transparent caching immediately, while those who have already deployed Procera’s solutions in their networks can easily insert and integrate Qwilt’s solution to enable transparent caching of online video. Network Resources Optimization: Procera’s Advanced Traffic Steering can selectively steer OTT traffic to Qwilt for classification and caching which results in a more efficient use of video caching resources. Service Model Innovation: Advanced analytics and reporting from Qwilt and Procera solutions can identify new service models and create new revenue streams by providing network operators with enhanced usage management and differentiated services based on video caching. Openet and Procera Networks demonstrated a turnkey Policy and Charging Control (PCC) solution based on network functions virtualization (NFV). The Revenue Express solution combines Openet’s Policy Manager and Procera’s Intelligent Policy Enforcement capabilities. The companies said elasticity is a key benefit for operators because the capacity dedicated to each network function can now be dynamically modified according to actual load on the network. Policy use cases of the virtualized solution include service plan provisioning and enforcement of tiered service and service passes which allow operators to accelerate data monetization by introducing segmented pricing that aligns network usage with revenue. Nokia Solutions and Networks announced two advancements in mobile traffic steering. Wi-Fi traffic steering, including automated creation of traffic steering rules, and enhanced ANDSF capabilities for real-time traffic steering based on network loading. 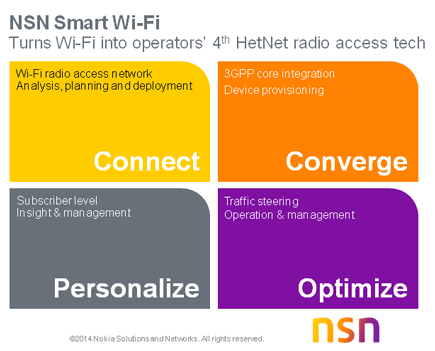 Both new features are part of NSN’s Smart Wi-Fi solution. NSN’s CEM Analytics for Traffic Steering analyzes network traffic and billing data trends to automatically generate and update ANDSF rules that govern how devices select cellular or Wi-Fi access. NSN Dynamic ANDSF software for mobile devices. While applying the ANDSF standard rules, operators can now also take into account network congestion and steer devices onto the radio access layer that will best maintain the experience of their most valued customers. Sequans Communications showed off its Cassiopeia silicon compliant with 3GPP Release 10 specifications and is software upgradeable to Release 11. Cassiopeia supports highly flexible dual carrier aggregation up to 40 MHz total bandwidth. In 30 MHz FDD, combining two channels of 10 MHz plus 20 MHz, which will be one of the most common configurations deployed by LTE operators, Cassiopeia can deliver maximum theoretical category 6 LTE throughput of up to 225 Mbps. The company says its carrier aggregation capability allows any two carriers of any size up to 20 MHz each, contiguous or non-contiguous, inter-band or intra-band, to be combined. 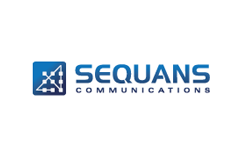 At Mobile World Congress, Sequans Communications and Alcatel-Lucent demonstrated carrier aggregation, using Sequans’ Cassiopeia LTE-Advanced Platform, and LTE Broadcast, using Sequans’ Mont Blanc LTE platform. The carrier aggregation demo showed Sequans’ Cassiopeia LTE-Advanced platform, as well as of Alcatel-Lucent’s LTE Overlay solution. In the LTE Broadcast demonstration, Sequans and Alcatel-Lucent showed tablets based on Sequans’ eMBMS-capable Mont Blanc LTE platform, receiving ideo content broadcast from Alcatel-Lucent’s LTE Overlay solution. 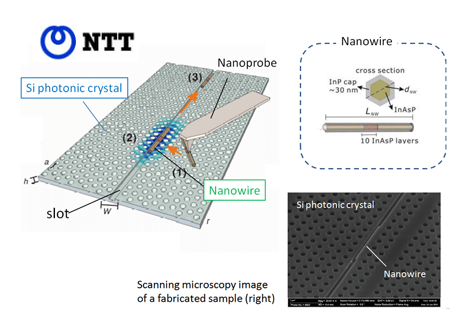 Researchers at Nippon Telegraph and Telephone (NTT) have developed a novel method to create an optical nanocavity at an arbitrary place on a silicon chip by placing a compound semiconductor nanowire on a silicon photonic crystal. NTT sais a large number of nanophotonic devices could be integrated on a silicon chip using this methos, paving the way for dense optical networks on a processor chip. NTT Nanophotonics Center (NPC) is located in Atsugi, Japan. The researchers plan to extend this approach to various nanowires with specific functions, such as optical gain or optical nonlinearity, so as to realize functional photonic devices, such as lasers and optical switches, on a silicon chip. NTT DOCOMO announced the first field test of an active antenna system that achieves a 4 dB reduction in electrical loss compared to conventional antennas. This promises to help enlarge the coverage range of base stations 1.7-fold. The active antenna system, which was developed by Tokyo-based Nihon Dengyo Kosaku Co., integrates multiple antenna elements, each equipped with a small transceiver, which enables installment in confined spaces and assures continued coverage if one or more of the transceivers fails. Simgo introduced a virtual SIM chipset that enables cellular users to benefit from reduced roaming costs, broadband global M2M, and increased operational efficiency. Simgo's solution, which allows for the separation of the SIM card from the cellular device, is comprised of 2 components: a remote device which acts like a SIM and a cloud-based platform which physically contains tens of thousands of SIMs. The remote device is available as either a smartphone cover, a self-contained module or a low power, 9x9mm chip to be integrated into equipment with cellular modules. The completely fault tolerant platform allocates service to all devices dynamically, supporting on-the-fly switching according to any business logic, ranging from simply assigning local SIMs to adaptively choosing the highest throughput SIM at any given time and location. At Mobile World Congress 2014 in Barcelona, RAD demonstrated Distributed NFV (D-NFV) that integrates a Layer2/Layer3 FPGA-based NID and compute infrastructure with a standard x86 server. “For that reason, service providers should have the freedom to locate virtual functions where they will be most practical, beneficial and cost-effective – not just at data centers but also at network nodes and the customer premises itself,” Broida states. Napatech introduced a 4-port 10 Gbps adapter provides a full 40 Gbps of packet analysis in networking appliciances. Napatech software provides hardware abstraction that allows up to eight network adapters in an appliance to appear as one, enabling up to 320 Gbps of throughput per appliance. Napatech allows real-time data from multiple points in the network to be collected and merged into a single analysis stream, allowing for easier correlation of analysis data. Precise merging is made possible by nanosecond precision time-stamping of every Ethernet frame, based on flexible support of multiple time synchronization schemes including IEEE1588-2008 Precision Time Protocol (PTP). "Network equipment manufacturers are focused on improving efficiency, performance and cost. To stay ahead of the data growth curve, our customers will need higher capacity appliances with multiple analysis ports that help them reduce their time to market and risk. Our new 4 port 10G product and Napatech Software Suite addresses these needs. Napatech will continue to offer the broadest portfolio to enable unprecedented throughput with guaranteed delivery of data," stated Erik Norup, president and CMO, Napatech.